Cherokee (ᏣᎳᎩ ᎦᏬᏂᎯᏍᏗ, Tsalagi Gawonihisdi [dʒalaˈɡî ɡawónihisˈdî]) is an endangered Iroquoian language and the native language of the Cherokee people. There are approximately 22,000 Cherokee speakers out of more than 300,000 tribal members. It is the only Southern Iroquoian language and differs significantly from the other Iroquoian languages. 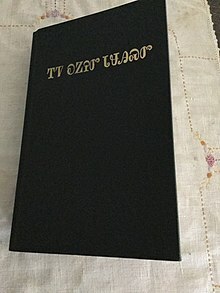 Cherokee is a polysynthetic language and uses a unique syllabary writing system. east Oklahoma; Great Smoky Mountains and Qualla Boundary in North Carolina Also in Arkansas. and Cherokee community in California. The dialect of Cherokee in Oklahoma is "definitely endangered", and the one in North Carolina is "severely endangered" according to UNESCO. The Lower dialect, formerly spoken on the South Carolina–Georgia border, has been extinct since about 1900. Less than 5% of Cherokee children are raised to be bilingual in Cherokee and English. Extensive documentation of the language exists, as it is the Native American language in which the most literature has been published. Such publications include a Cherokee dictionary and grammar as well as several editions of the New Testament and Psalms of the Bible and the Cherokee Phoenix (ᏣᎳᎩ ᏧᎴᎯᏌᏅᎯ, Tsalagi Tsulehisanvhi), the first newspaper published by Native Americans in the United States and the first published in a Native American language. Significant numbers[quantify] of Cherokee speakers of all ages still populate the Qualla Boundary in Cherokee, North Carolina and several counties within the Cherokee Nation of Oklahoma, significantly Cherokee, Sequoyah, Mayes, Adair, and Delaware. Increasing numbers of Cherokee youth are renewing interest in the traditions, history, and language of their ancestors. As a polysynthetic language, Cherokee is highly different from English and other Indo-European languages like French or Spanish, and can offer many challenges to adult learners. A single Cherokee word can convey ideas that would require multiple English words to express, including the context of the assertion, connotations about the speaker, the action, and the object of the action. The morphological complexity of the Cherokee language is best exhibited in verbs, which comprise approximately 75% of the language, as opposed to only 25% of the English language. Verbs must contain at minimum a pronominal prefix, a verb root, an aspect suffix, and a modal suffix. Cherokee is an Iroquoian language, and the only Southern Iroquoian language spoken today. Linguists believe that the Cherokee people migrated to the southeast from the Great Lakes region about three thousand years ago, bringing with them their language. Despite the three-thousand-year geographic separation, the Cherokee language today still shows some similarities to the languages spoken around the Great Lakes, such as Mohawk, Onondaga, Seneca, and Tuscarora. Some researchers (such as Thomas Whyte) have suggested the homeland of the proto-Iroquoian language resides in Appalachia. Whyte contends, based on linguistic and molecular studies, that proto-Iroquoian speakers participated in cultural and economic exchanges along the north-south axis of the Appalachian Mountains. The divergence of Southern Iroquoian (which Cherokee is the only known branch of) from the Northern Iroquoian languages occurred approximately 4,000-3,000 years ago as Late Archaic proto-Iroquoian speaking peoples became more sedentary with the advent of horticulture, advancement of lithic technologies and the emergence of social complexity in the Eastern Woodlands. In the subsequent millennia, the Northern Iroquoian and Southern Iroquoian would be separated by various Algonquin and Siouan speaking peoples as linguistic, religious, social and technological practices from the Algonquin to the north and east and the Siouans to the west from the Ohio Valley would come to be practiced by peoples in the Chesapeake region, as well as parts of the Carolinas. Before the development of the Cherokee syllabary in the 1820s, Cherokee was a spoken language only. The Cherokee syllabary is a syllabary invented by Sequoyah to write the Cherokee language in the late 1810s and early 1820s. His creation of the syllabary is particularly noteworthy in that he could not previously read any script. Sequoyah had some contact with English literacy and the Roman alphabet through his proximity to Fort Loundon, where he engaged in trade with Europeans. He was exposed to English literacy through his white father. His limited understanding of the Roman alphabet, including the ability to recognize the letters of his name, may have aided him in the creation of the Cherokee syllabary. When developing the written language, Sequoyah first experimented with logograms, but his system later developed into a syllabary. In his system, each symbol represents a syllable rather than a single phoneme; the 85 (originally 86) characters in the Cherokee syllabary provide a suitable method to write Cherokee. Some symbols do resemble the Latin, Greek and even the Cyrillic scripts' letters, but the sounds are completely different (for example, the sound /a/ is written with a letter that resembles Latin D). Around 1809, Sequoyah began work to create a system of writing for the Cherokee language. At first he sought to create a character for each word in the language. He spent a year on this effort, leaving his fields unplanted, so that his friends and neighbors thought he had lost his mind. His wife is said to have burned his initial work, believing it to be witchcraft. He finally realized that this approach was impractical because it would require too many pictures to be remembered. He then tried making a symbol for every idea, but this also caused too many problems to be practical. Sequoyah did not succeed until he gave up trying to represent entire words and developed a symbol for each syllable in the language. After approximately a month, he had a system of 86 characters, some of which were Latin letters he obtained from a spelling book. "In their present form, many of the syllabary characters resemble Roman, Cyrillic or Greek letters or Arabic numerals," says Janine Scancarelli, a scholar of Cherokee writing, "but there is no apparent relationship between their sounds in other languages and in Cherokee." Unable to find adults willing to learn the syllabary, he taught it to his daughter, Ayokeh (also spelled Ayoka). Langguth says she was only six years old at the time. He traveled to the Indian Reserves in the Arkansaw Territory where some Cherokee had settled. When he tried to convince the local leaders of the syllabary's usefulness, they doubted him, believing that the symbols were merely ad hoc reminders. Sequoyah asked each to say a word, which he wrote down, and then called his daughter in to read the words back. This demonstration convinced the leaders to let him teach the syllabary to a few more people. This took several months, during which it was rumored that he might be using the students for sorcery. After completing the lessons, Sequoyah wrote a dictated letter to each student, and read a dictated response. This test convinced the western Cherokee that he had created a practical writing system. When Sequoyah returned east, he brought a sealed envelope containing a written speech from one of the Arkansas Cherokee leaders. By reading this speech, he convinced the eastern Cherokee also to learn the system, after which it spread rapidly. In 1825 the Cherokee Nation officially adopted the writing system. From 1828 to 1834, American missionaries assisted the Cherokee in using Sequoyah's syllabary to develop type characters and print the Cherokee Phoenix, the first newspaper of the Cherokee Nation, with text in both Cherokee and English. 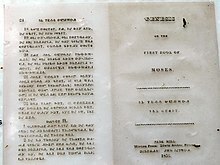 In 1826, the Cherokee National Council commissioned George Lowrey and David Brown to translate and print eight copies of the laws of the Cherokee Nation in the new Cherokee language using Sequoyah's system. Once Albert Gallatin saw a copy of Sequoyah's syllabary, he found the syllabary superior to the English alphabet. Even though the Cherokee student must learn 85 characters instead of 26, he can read immediately. The student could accomplish in a few weeks what students of English writing could learn in two years. In 1824, the General Council of the Eastern Cherokee awarded Sequoyah a large silver medal in honor of the syllabary. According to Davis, one side of the medal bore his image surrounded by the inscription in English, "Presented to George Gist by the General Council of the Cherokee for his ingenuity in the invention of the Cherokee Alphabet." The reverse side showed two long-stemmed pipes and the same inscription written in Cherokee. Supposedly, Sequoyah wore the medal throughout the rest of his life and it was buried with him. By 1825, the Bible and numerous religious hymns and pamphlets, educational materials, legal documents and books were translated into the Cherokee language. Thousands of Cherokee became literate and the literacy rate for Cherokee in the syllabary was higher than that of whites in the English alphabet. Though use of the Cherokee syllabary declined after many of the Cherokee were relocated to Indian Territory, present day Oklahoma, it has survived in private correspondence, renderings of the Bible, and descriptions of Indian medicine and now can be found in books and on the internet among other places. Nearly two hundred years later, John Standingdeer Jr. developed computer software to help people learn the language, based on dividing Sequoyah's 85 characters into 16 basic sounds. Cherokee is the most populous Native American language spoken in the U.S. states of Oklahoma, North Carolina, South Carolina, Arkansas, Missouri, Indiana, Georgia, Alabama, Virginia, West Virginia, Maryland, Texas, Tennessee, and Kentucky. The language has remained vigorous in some Oklahoma communities and elsewhere, communities like Big Cove and Snowbird of the Eastern Band in North Carolina still predominantly speak Cherokee. Cherokee is one of only five Oklahoma aboriginal languages still spoken and acquired by children. At the time of European contact, there were three major dialects of Cherokee: Lower, Middle, and Overhill. The Lower dialect, formerly spoken on the South Carolina-Georgia border, has been extinct since about 1900. Of the remaining two dialects, the Middle dialect (Kituwah) is spoken by the Eastern band on the Qualla Boundary, and retains 1,000 speakers  or fewer. The Overhill, or Western, dialect is spoken in eastern Oklahoma and by the Snowbird Community in North Carolina  by an estimated 9,000 people or more. The Western dialect is most widely used and is considered the main dialect of the language. Both dialects have had English influence, with the Overhill, or Western dialect showing some Spanish influence as well. The now extinct Lower dialect spoken by the inhabitants of the Lower Towns in the vicinity of the South Carolina–Georgia border had r as the liquid consonant in its inventory, while both the contemporary Kituhwa or Ani-kituwah dialect spoken in North Carolina and the Overhill dialect contain l. Only Oklahoma Cherokee developed tone. Both the Lower dialect and the Kituhwa dialect have a "ts" sound in place of the "tl" sound of the Overhill dialect. For instance, the word for 'no' is ᎥᏝ (ə̃tˤɑ or [ə̃tl̥á]) in the Overhill dialect, but ᎥᏣ (ə̃sɑ) in both the Lower and Kituhwa dialects. There are two main dialects of Cherokee spoken by modern speakers. The Giduwa dialect (Eastern Band) and the Otali dialect (also called the Overhill dialect) spoken in Oklahoma. The Otali dialect has drifted significantly from Sequoyah's syllabary in the past 150 years, and many contracted and borrowed words have been adopted into the language. These noun and verb roots in Cherokee, however, can still be mapped to Sequoyah's syllabary. In modern times, there are more than 85 syllables in use by modern Cherokee speakers. Modern Cherokee speakers who speak Otali employ 122 distinct syllables in Oklahoma. Tahlequah is a city in Oklahoma where Cherokee is still predominantly spoken. A lesson at Kituwah Academy on the Qualla Boundary in North Carolina. The language immersion school, operated by the Eastern Band of Cherokee Indians, teaches the same curriculum as other American primary schools, but the Cherokee language is the medium of instruction from pre-school on up and students learn it as a first language. Such schools have proven instrumental in the preservation and perpetuation of the Cherokee language. The Cherokee language currently retains between 10,400 and 22,500 speakers, being spoken by roughly 10,000 of the 122,000-member Cherokee Nation in Oklahoma, by 1,000 of the 10,000-member Eastern Band of Cherokee in North Carolina, and by a high percentage of the 7,500 members of the United Keetoowah Band of Oklahoma and Arkansas. Cherokee speakers make up 17% of the total population of Cherokee people, and over 60% of the total population of the United Keetoowah Band. In 1986, the literacy rate for first language speakers was 15–20% who could read and 5% who could write, according to the 1986 Cherokee Heritage Center. A 2005 survey determined that the Eastern band had 460 fluent speakers. Ten years later, the number was believed to be 200. Cherokee is "definitely endangered" in Oklahoma and "severely endangered" in North Carolina according to UNESCO. Cherokee has been the co-official language of the Cherokee Nation alongside English since a 1991 legislation officially proclaimed this under the Act Relating to the Tribal Policy for the Promotion and Preservation of Cherokee Language, History, and Culture. Cherokee is also recognised as the official language of the United Keetoowah Band of Cherokee Indians. As Cherokee is official, the entire constitution of the United Keetoowah Band is available in both English and Cherokee. As an official language, any tribal member may communicate with the tribal government in Cherokee or English, English translation services are provided for Cherokee speakers, and both Cherokee and English are used when the tribe provides services, resources, and information to tribal members or when communicating with the tribal council. The 1991 legislation allows the political branch of the nation to maintain Cherokee as a living language. Because they are within the Cherokee Nation tribal jurisdiction area, hospitals and health centers such as the Three Rivers Health Center in Muscogee, Oklahoma provide Cherokee language translation services. Oklahoma Cherokee language immersion school student writing in the Cherokee syllabary. In 2008 The Cherokee Nation instigated a 10-year language preservation plan that involved growing new fluent speakers of the Cherokee language from childhood on up through school immersion programs, as well as a collaborative community effort to continue to use the language at home. This plan was part of an ambitious goal that in 50 years, 80 percent or more of the Cherokee people will be fluent in the language. The Cherokee Preservation Foundation has invested $4.5 million into opening schools, training teachers, and developing curricula for language education, as well as initiating community gatherings where the language can be actively used. They have accomplished: "Curriculum development, teaching materials and teacher training for a total immersion program for children, beginning when they are preschoolers, that enables them to learn Cherokee as their first language. The participating children and their parents learn to speak and read together. The Tribe operates the Kituwah Academy". Formed in 2006, the Kituwah Preservation & Education Program (KPEP) on the Qualla Boundary focuses on language immersion programs for children from birth to fifth grade, developing cultural resources for the general public and community language programs to foster the Cherokee language among adults. There is also a Cherokee language immersion school in Tahlequah, Oklahoma that educates students from pre-school through eighth grade. Several universities offer Cherokee as a second language, including the University of Oklahoma, Northeastern State University, and Western Carolina University. Western Carolina University (WCU) has partnered with the Eastern Band of Cherokee Indians (EBCI) to promote and restore the language through the school's Cherokee Studies program, which offers classes in and about the language and culture of the Cherokee Indians. WCU and the EBCI have initiated a ten-year language revitalization plan consisting of: (1) a continuation of the improvement and expansion of the EBCI Atse Kituwah Cherokee Language Immersion School, (2) continued development of Cherokee language learning resources, and (3) building of Western Carolina University programs to offer a more comprehensive language training curriculum. The family of Iroquoian languages has a unique phonological inventory. Unlike most languages, the Cherokee inventory of consonants lacks the labial sounds p, b, f, and v. Cherokee does, however, have one labial consonant m, but it is rare, appearing in no more than ten native words. In fact, the Lower dialect does not produce m at all. Instead, it uses w.
In the case of p, qw is often substituted, as in the name of the Cherokee Wikipedia, Wiɣiqwejdiʃ. Some words may contain sounds not reflected in the given phonology: for instance, the modern Oklahoma use of the loanword "automobile", with the /ɔ/ and /b/ sounds of English. As with many Iroquoian languages, Cherokee's phonetic inventory is small. The consonants for North Carolina Cherokee are given in the table below. The consonants of all Iroquoian languages pattern so that they may be grouped as (oral) obstruents, sibilants, laryngeals, and resonants (Lounsbury 1978:337). Obstruents are non-distinctively aspirated when they precede h. There is some variation in how orthographies represent these allophones. The orthography used in the table represents the aspirated allophones as th, kh, and tsh. Another common orthography represents the unaspirated allophones as d, ɣ, and dz and the aspirated allophones as t, k, and s (Scancarelli 2005:359–62). The unaspirated plosives and affricate are optionally voiced intervocally. In other dialects, the affricate is a palatal (like ch in "church"), and a lateral affricate (like tl in "atlas") may also be present. There are six short vowels and six long vowels in the Cherokee inventory. As with all Iroquoian languages, this includes a nasalized vowel (Lounsbury 1978:337). In the case of Cherokee, the nasalized vowel is a mid central vowel usually represented as v and is pronounced [ə̃], as "a" in unstressed "comma" plus the nasalization found in French un. Other vowels, when ending a word, are often also nasalized. Vowels can be short or long. Oklahoma Cherokee has six phonemic tones, two of which are level (low, high) and the other four of which are contour (rising, falling, highfall, lowfall). While the tonal system is undergoing a gradual simplification in many areas, it remains important in meaning and is still held strongly by many, especially older, speakers. Tone is poorly documented in North Carolina Cherokee. The syllabary, moreover, does not display tone, and real meaning discrepancies[clarification needed] are rare within the native-language Cherokee-speaking community. The same goes for transliterated Cherokee ("osiyo", "dohitsu", etc. ), which is rarely written with any tone markers, except in dictionaries. Native speakers can tell the difference between written tone-distinguished words by context. The tone name in the left-hand column displays the labels most recently used in studies of the language. The second represents the tone in standardized IPA. Highfall has a unique grammatical usage, primarily appearing with adjectives and adverbials along with most nouns derived from verbs. It only appears in verbs subordinate to another element of the sentence. When a highfall appears on a verb it changes the verb's role in the sentence, typically to one of four main categories: agentive derivation, modal, object derivation, or subordination. The pronominal prefix is g-, which indicates first person singular. The verb root is -e, "to go." The aspect suffix that this verb employs for the present-tense stem is -g-. The present-tense modal suffix for regular verbs in Cherokee is -a.
Cherokee has 17 verb tenses and 10 persons. The following is a conjugation in the present tense of the verb to go. Please note that there is no distinction between dual and plural in the 3rd person. Singular Dual incl. Dual excl. Plural incl. Plural excl. The translation uses the present progressive ("at this time I am going"). Cherokee differentiates between progressive ("I am going") and habitual ("I go") more than English does. The forms ᎨᎪᎢ, ᎮᎪᎢ, ᎡᎪᎢ gegoi, hegoi, egoi represent "I often/usually go", "you often/usually go", and "she/he/it often/usually goes", respectively. Verbs can also have prepronominal prefixes, reflexive prefixes, and derivative suffixes. Given all possible combinations of affixes, each regular verb can have 21,262 inflected forms. Cherokee does not make gender distinctions. For example, ᎦᏬᏂᎭ gawoniha can mean either "she is speaking" or "he is speaking." Like many Native American languages, Cherokee has many pronominal prefixes that can index both subject and object. Pronominal prefixes always appear on verbs and can also appear on adjectives and nouns. There are two separate words which function as pronouns: aya "I, me" and nihi "you". Conjugation of "Hand him ..."
There have been reports that the youngest speakers of Cherokee are using only the indefinite forms, suggesting a decline in usage or full acquisition of the system of shape classification. Cherokee is the only Iroquoian language with this type of classificatory verb system, leading linguists to reanalyze it as a potential remnant of a noun incorporation system in Proto-Iroquoian. However, given the non-productive nature of noun incorporation in Cherokee, other linguists have suggested that classificatory verbs are the product of historical contact between Cherokee and non-Iroquoian languages, and instead that the noun incorporation system in Northern Iroquoian languages developed later. Simple declarative sentences usually have a subject-object-verb word order. Negative sentences have a different word order. Adjectives come before nouns, as in English. Demonstratives, such as ᎾᏍᎩ nasgi ("that") or ᎯᎠ hia ("this"), come at the beginning of noun phrases. Relative clauses follow noun phrases. Adverbs precede the verbs that they are modifying. For example, "she's speaking loudly" is ᎠᏍᏓᏯ ᎦᏬᏂᎭ asdaya gawoniha (literally, "loud she's-speaking"). A Cherokee sentence may not have a verb as when two noun phrases form a sentence. In such a case, word order is flexible. For example, Ꮎ ᎠᏍᎦᏯ ᎠᎩᏙᏓ na asgaya agidoda ("that man is my father"). A noun phrase might be followed by an adjective, such as in ᎠᎩᏙᏓ ᎤᏔᎾ agidoga utana ("my father is big"). Cherokee is written in an 85-character syllabary invented by Sequoyah (also known as Guest or George Gist). Many of the letters resemble the Latin letters they derive from, but have completely unrelated sound values; Sequoyah had seen English, Hebrew, and Greek writing but did not know how to read them. Two other scripts used to write Cherokee are a simple Latin transliteration and a more precise system with diacritical marks. The charts below show the syllabary as arranged by Samuel Worcester along with his commonly used transliterations. He played a key role in the development of Cherokee printing from 1828 until his death in 1859. In the chart, ‘v’ represents a nasal vowel, /ə̃/. The phonetic values of these characters do not equate directly to those represented by the letters of the Latin script. Some characters represent two distinct phonetic values (actually heard as different syllables), while others often represent different forms of the same syllable. [page needed] Not all phonemic distinctions of the spoken language are represented. For example, while /d/ + vowel syllables are mostly differentiated from /t/ + vowel by use of different graphs, syllables beginning with /ɡ/ are all conflated with those beginning with /k/. Also, long vowels are not ordinarily distinguished from short vowels, tones are not marked, and there is no regular rule for representing consonant clusters. However, in more recent technical literature, length of vowels can actually be indicated using a colon, and other disambiguation methods for consonants (somewhat like the Japanese dakuten) have been suggested. Six distinctive vowel qualities are represented in the Cherokee syllabary based on where they are pronounced in the mouth, including the high vowels i and u, mid vowels e, v, and o, and low vowel a. The syllabary also does not distinguish among syllables that end in vowels, h, or glottal stop. For example, the single symbol, Ꮡ, is used to represent both su as in su:dali, meaning six (ᏑᏓᎵ), and suh as in suhdi, meaning 'fishhook' (ᏑᏗ). Therefore, there is no differentiation among the symbols used for syllables ending in a single vowel versus that vowel plus "h." When consonants other than s, h, or glottal stop arise with other consonants in clusters, the appropriate consonant plus a "dummy vowel" is used. This dummy vowel is not pronounced and is either chosen arbitrarily or for etymological reasons (reflecting an underlying etymological vowel). For example, ᏧᎾᏍᏗ (tsu-na-s-di) represents the word ju:nsdi, meaning 'small.' Ns in this case is the consonant cluster that requires the following dummy vowel, a. Ns is written as ᎾᏍ /nas/. The vowel is included in the transliteration, but is not pronounced in the word (ju:nsdi). (The transliterated ts represents the affricate j, as in other Iroquoian languages due to etymological reasons, cf. the Korean letter ㅈ). [page needed] As with some other writing systems (like Arabic), adult speakers can distinguish words by context. For these examples, the back conversion is likely to join s-a as sa or s-i as si. Transliterations sometimes insert an apostrophe to prevent this, producing itsalis'anedi (cf. Man'yoshu). ᏀᎾ transliterates as nahna, yet so does ᎾᎿ. The former is nah-na, the latter is na-hna. If the Latin script is parsed from left to right, longest match first, then without special provisions, the back conversion would be wrong for the latter. There are several similar examples involving these character combinations: naha nahe nahi naho nahu nahv. Cherokee was added to the Unicode Standard in September, 1999 with the release of version 3.0. The main Unicode block for Cherokee is U+13A0–U+13FF. [note 1] It contains the script's upper-case syllables as well as six lower-case syllables. The rest of the lower-case syllables are encoded at U+AB70–ABBF. A single Cherokee Unicode font, Plantagenet Cherokee, is supplied with macOS, version 10.3 (Panther) and later. Windows Vista also includes a Cherokee font. Several free Cherokee fonts are available including Digohweli, Donisiladv, and Noto Sans Cherokee. Some pan-Unicode fonts, such as Code2000, Everson Mono, and GNU FreeFont, include Cherokee characters. A commercial font, Phoreus Cherokee, published by TypeCulture, includes multiple weights and styles. The Cherokee Nation Language Technology Program supports "innovative solutions for the Cherokee language on all digital platforms including smartphones, laptops, desktops, tablets and social networks." 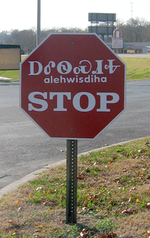 Cherokee stop sign, Tahlequah, Oklahoma, with "alehwisdiha" (also spelled "halehwisda") meaning "stop"
Cherokee traffic sign in Tahlequah, Oklahoma, reading "tla adi yigi", meaning "no parking" from "tla" meaning "no"
Cherokee uses Arabic numerals (0–9). The Cherokee council voted not to adopt Sequoyah's numbering system. Sequoyah created individual symbols for 1–20, 30, 40, 50, 60, 70, 80, 90, and 100 as well as a symbol for three zeros for numbers in the thousands, and a symbol for six zeros for numbers in the millions. These last two symbols, representing ",000" and ",000,000", are made up of two separate symbols each. They have a symbol in common, which could be used as a zero in itself. The polysynthetic nature of the Cherokee language enables the language to develop new descriptive words in Cherokee to reflect or express new concepts. Some good examples are ᏗᏘᏲᎯᎯ (ditiyohihi, "he argues repeatedly and on purpose with a purpose") corresponding to "attorney" and ᏗᏓᏂᏱᏍᎩ (didaniyisgi, "the final catcher" or "he catches them finally and conclusively") for "policeman." Other words have been adopted from another language such as the English word gasoline, which in Cherokee is ᎦᏐᎵᏁ (gasoline). Other words were adopted from the languages of tribes who settled in Oklahoma in the early 1900s. One interesting and humorous example is the name of Nowata, Oklahoma deriving from nowata, a Delaware word for "welcome" (more precisely the Delaware word is nuwita which can mean "welcome" or "friend" in the Delaware languages). The white settlers of the area used the name nowata for the township, and local Cherokee, being unaware that the word had its origins in the Delaware language, called the town ᎠᎹᏗᎧᏂᎬᎾᎬᎾ (Amadikanigvnagvna) which means "the water is all gone gone from here" – i.e. "no water." Other examples of adopted words are ᎧᏫ (kawi) for "coffee" and ᏩᏥ (watsi) for "watch"; which led to ᎤᏔᎾ ᏩᏥ (utana watsi, "big watch") for clock. Meaning expansion can be illustrated by the words for "warm" and "cold", which can be also extended to mean "south" and "north". Around the time of the American Civil War, they were further extended to US party labels, Democratic and Republican, respectively. ale sagwu gesv junilvwisdanedi anahldinvdlv adanvdo gvhdi. and should act towards one another in a spirit of brotherhood. ᎠᎴ ᏌᏊ ᎨᏒ ᏧᏂᎸᏫᏍᏓᏁᏗ ᎠᎾᏟᏅᏢ ᎠᏓᏅᏙ ᎬᏗ. ^ Neely, Sharlotte (March 15, 2011). Snowbird Cherokees: People of Persistence. University of Georgia Press. pp. 147–148. ISBN 9780820340746. Retrieved May 22, 2014. ^ Frey, Ben (2005). "A Look at the Cherokee Language" (PDF). Tar Heel Junior Historian. North Carolina Museum of History. Archived from the original (PDF) on 2013-06-07. Retrieved May 22, 2014. ^ "Cherokee". Endangered Languages Project. Retrieved April 9, 2014. ^ "Table 1. Detailed Languages Spoken at Home and Ability to Speak English for the Population 5 Years and Over for the United States: 2006–2008" (XLS). United States Census Bureau. April 2010. Retrieved 18 January 2015. ^ a b c d "Keetoowah Cherokee is the Official Language of the UKB" (PDF). keetoowahcherokee.org/. Keetoowah Cherokee News: Official Publication of the United Keetoowah Band of Cherokee Indians in Oklahoma. April 2009. Archived from the original (PDF) on July 15, 2014. Retrieved June 1, 2014. ^ a b c d "Language & Culture". keetoowahcherokee.org/. United Keetoowah Band of Cherokee Indians. Archived from the original on April 25, 2014. Retrieved June 1, 2014. ^ "UKB Constitution and By-Laws in the Keetoowah Cherokee Language" (PDF). United Keetoowah Band of Cherokee Indians. Archived from the original (PDF) on February 1, 2016. Retrieved June 2, 2014. ^ Hammarström, Harald; Forkel, Robert; Haspelmath, Martin, eds. (2017). "Cherokee". Glottolog 3.0. Jena, Germany: Max Planck Institute for the Science of Human History. ^ a b c d e f g "Cherokee: A Language of the United States". Ethnologue. SIL International. 2013. Retrieved May 22, 2014. ^ Montgomery-Anderson, Brad (June 2008). "Citing Verbs in Polysynthetic Languages: The Case of the Cherokee-English Dictionary". Southwest Journal of Linguistics. 27. Retrieved May 22, 2014. ^ "Cherokee Syllabary". Omniglot. Retrieved May 22, 2014. ^ a b "UNESCO Atlas of the World's Languages in danger". www.unesco.org. Retrieved 2017-12-17. ^ a b Scancarelli, Janine; Hardy, Heather Kay (2005-01-01). Native Languages of the Southeastern United States. U of Nebraska Press. ISBN 0803242352. ^ a b "Native Languages of the Americas: Cherokee (Tsalagi)". Native Languages of the Americas. Retrieved May 22, 2014. ^ LeBeau, Patrik. Term Paper Resource Guide to American Indian History. Greenwoord. Westport, CT: 2009. p132. ^ Woods, Thomas E. Exploring American History: Penn, William – Serra, Junípero Cavendish. Tarrytown, NY: 2008. p829. ^ a b c d e f Thompson, Irene (August 6, 2013). "Cherokee". aboutworldlanguages.com. Retrieved May 22, 2014. ^ Cushman, Ellen (2011). ""We're Taking the Genius of Sequoyah into This Century": The Cherokee Syllabary, Peoplehood, and Perseverance". Wicazo Sa Review. University of Minnesota Press. 26: 72–75. doi:10.5749/wicazosareview.26.1.0067. JSTOR 10.5749/wicazosareview.26.1.0067. ^ Sturtevant & Fogelson 2004, p. 337. ^ a b c d Wilford, John Noble (June 22, 2009). "Carvings From Cherokee Script's Dawn". New York Times. Retrieved June 23, 2009. ^ a b c G. C. (August 13, 1820). "Invention of the Cherokee Alphabet". Cherokee Phoenix. 1 (24). ^ a b c Boudinot, Elias (April 1, 1832). "Invention of a New Alphabet". American Annals of Education. ^ a b c Davis, John B. Chronicles of Oklahoma. Vol. 8, Number 2. "The Life and Work of Sequoyah." June 1930. Retrieved April 4, 2013. ^ "Cherokee language". www.britannica.com. Encyclopædia Britannica. Retrieved May 22, 2014. ^ a b c Neal, Dale (January 4, 2016). "Cracking the code to speak Cherokee". Asheville Citizen-Times. ^ "Cherokee: A Language of the United States". Ethnologue: Languages of the World. SIL International. 2009. Archived from the original on 2014-07-14. Retrieved May 22, 2014. ^ "Cherokee Language & Culture". Indian Country Diaries. pbs. Retrieved June 1, 2014. ^ a b Anderton, Alice, PhD. Status of Indian Languages in Oklahoma. Intertribal Wordpath Society. 2009. Retrieved March 12, 2009. ^ "Frequently Asked Questions: Do Cherokee people still practice their traditional culture?". www.cherokeemuseum.org. The Museum of the Cherokee Indian. Archived from the original on August 30, 2014. Retrieved June 1, 2014. ^ "Iroquoian Languages". www.mingolanguage.org. mingolanguage.org. Retrieved May 22, 2014. ^ a b c Cushman, Ellen (September 13, 2012). The Cherokee Syllabary: Writing the People's Perseverance. Chapter 8 – Peoplehood and Perseverance: The Cherokee Language, 1980–2010: University of Oklahoma Press. pp. 189–191. ISBN 9780806185484. Retrieved June 2, 2014. ^ "Health Centers & Hospitals". Cherokee Nation. Retrieved June 5, 2014. ^ "Native Now : Language: Cherokee". We Shall Remain – American Experience – PBS. 2008. Retrieved April 9, 2014. ^ Kituwah Preservation & Education Program Powerpoint, by Renissa Walker (2012)'. 2012. Print. ^ a b "Cherokee Language Revitalization Project". Western Carolina University. 2014. Archived from the original on April 7, 2014. Retrieved April 9, 2014. ^ King, Duane Harold (1975). A Grammar and Dictionary of the Cherokee Language. pp. 16, 21. ^ King, Duane (1975). A Grammar and Dictionary of the Cherokee Language. Ph.D. Dissertation, University of Georgia. ^ Scancarelli, Janine; Hardy, Heather Kay (2005-01-01). Native Languages of the Southeastern United States. U of Nebraska Press. ISBN 0803242352. ^ Mithun, Marianne (1984). "The Evolution of Noun Incorporation". Language. 60 (60): 847–894. doi:10.1353/lan.1984.0038. ^ Chafe, Wallace. 2000. "Florescence as a force in grammaticalization." Reconstructing Grammar, ed. Spike Gildea, pp. 39–64. Amsterdam: John Benjamins. ^ Holmes, Ruth (1977) . "Cherokee Lesson 23". Beginning Cherokee. University of Oklahoma Press:Norman. p. 209. ISBN 978-0-8061-1463-7. ^ a b Walker & Sarbaugh 1993. ^ "Phoreus Cherokee". TypeCulture. Retrieved 15 January 2018. ^ Avila, Eduardo (September 13, 2015). "How the Cherokee language has adapted to texts, iPhones". Public Radio International, Digital Voices Online. Retrieved 2015-10-03. ^ a b "Numbers in Cherokee". omniglot.com. Retrieved May 18, 2015. ^ "Dikaneisdi (Word List)". cherokee.org. Retrieved May 18, 2015. ^ This has been confirmed using the online transliteration service. ^ The PDF Unicode chart shows the new-form of the letter do. Feeling, Durbin. Cherokee-English Dictionary: Tsalagi-Yonega Didehlogwasdohdi. Tahlequah, Oklahoma: Cherokee Nation, 1975. Feeling, Durbin, Craig Kopris, Jordan Lachler, and Charles van Tuyl. A Handbook of the Cherokee Verb: A Preliminary Study. Tahlequah, Oklahoma: Cherokee Heritage Center, 2003. ISBN 978-0-9742818-0-3. Holmes, Ruth Bradley, and Betty Sharp Smith. Beginning Cherokee: Talisgo Galiquogi Dideliquasdodi Tsalagi Digohweli. Norman: University of Oklahoma Press, 1976. Montgomery-Anderson, Brad (May 30, 2008). "A Reference Grammar of Oklahoma Cherokee" (PDF). Robinson, Prentice. Conjugation Made Easy: Cherokee Verb Study. Tulsa, Oklahoma: Cherokee Language and Culture, 2004. ISBN 978-1-882182-34-3. Scancarelli, Janine (2005). "Cherokee". in Janine Scancarelli and Heather K. Hardy (eds.). Native Languages of the Southeastern United States. Lincoln, NE: University of Nebraska Press in cooperation with the American Indian Studies Research Institute, Indiana University, Bloomington. pp. 351–384. OCLC 56834622. Bender, Margaret (2008). "Indexicality, voice, and context in the distribution of Cherokee scripts". International Journal of the Sociology of Language. 192 (192): 91–104. doi:10.1515/ijsl.2008.037. Daniels, Peter T (1996), The World's Writing Systems, New York: Oxford University Press, pp. 587–92 . Foley, Lawrence (1980), Phonological Variation in Western Cherokee, New York: Garland Publishing . Kilpatrick, Jack F; Kilpatrick, Anna Gritts, New Echota Letters, Dallas: Southern Methodist University Press . Scancarelli, Janine (2005), "Cherokee", in Hardy, Heather K; Scancarelli, Janine, Native Languages of the Southeastern United States, Bloomington: Nebraska Press, pp. 351–84 . Tuchscherer, Konrad; Hair, PEH (2002), "Cherokee and West Africa: Examining the Origins of the Vai Script", History in Africa, 29: 427–86, doi:10.2307/3172173, JSTOR 3172173 . Sturtevant, William C (general); Fogelson (volume), Raymond D, eds. (2004), Handbook of North American Indians: Southeast, 14, Washington, DC: Smithsonian Institution, ISBN 0-16-072300-0 . Walker, Willard; Sarbaugh, James (1993), "The Early History of the Cherokee Syllabary", Ethnohistory, 40 (1): 70–94, doi:10.2307/482159 . Cook, William Hinton (1979). A Grammar of North Carolina Cherokee. Ph.D. diss., Yale University. OCLC 7562394. King, Duane H. (1975). A Grammar and Dictionary of the Cherokee Language. Ph.D. diss., University of Georgia. OCLC 6203735. Lounsbury, Floyd G. (1978). "Iroquoian Languages". in Bruce G. Trigger (ed.). Handbook of North American Indians, Vol. 15: Northeast. Washington, DC: Smithsonian Institution. pp. 334–343. OCLC 12682465. Munro, Pamela (ed.) (1996). Cherokee Papers from UCLA. UCLA Occasional Papers in Linguistics, no. 16. OCLC 36854333. Scancarelli, Janine (1987). Grammatical Relations and Verb Agreement in Cherokee. Ph.D. diss., University of California, Los Angeles. OCLC 40812890. Scancarelli, Janine. "Cherokee Writing." The World's Writing Systems. 1998: Section 53. Look up Cherokee in Wiktionary, the free dictionary. Wikimedia Commons has media related to Cherokee script. Cherokee New Testament Online Online translation of the New Testament. Currently the largest Cherokee document on the internet. "Native American Audio Collections: Cherokee". American Philosophical Society. Archived from the original on 2013-03-02. Retrieved 2013-05-20. Cherokee Language Texts, from the Boston Athenæum: Schoolcraft Collection of Books in Native American Languages. Digital Collection.